If you’re anything like me, you have been stumped trying to explain The Rise to a non-Riser. The easy answer, “we’re a group of friends who like to wake up early, workout outdoors, and drop sweat stains on the concrete. We are rain or shine, we get breakfast together and we hangout all the time”. 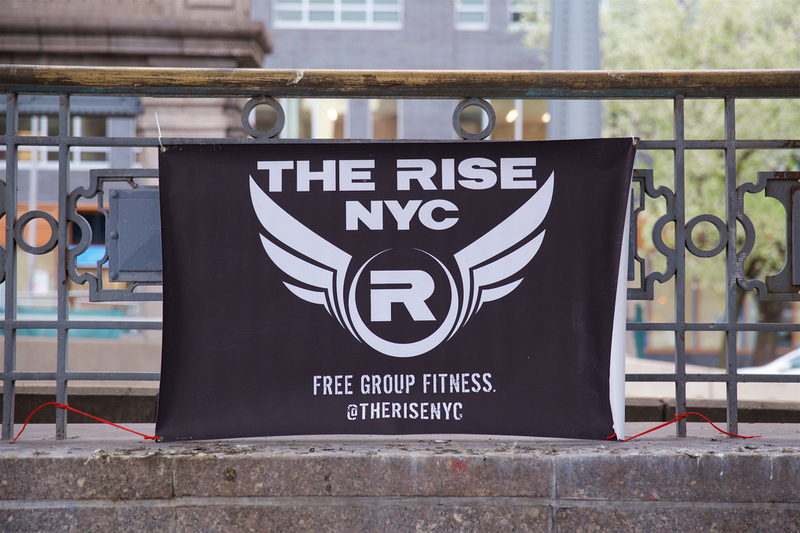 If you want to give the textbook answer: “The Rise is a workout group that meets Monday through Friday throughout Manhattan, Brooklyn and Queens at 6:30AM. Every so often, we meet on Friday nights for a Flash Rise Friday and bring our morning awesome to random locations throughout Manhattan.” We can all agree, that The Rise is ultimately focused on creating a community of people from all walks of life who are dedicated to improving both their bodies and their minds. This is exactly why this summer, we are partnering with The Movement Creative as they create a playscape on Governor’s Island through a fully funded indiegogo (click here for images and details) which will get people of all ages and abilities moving and enjoying the outdoors. We will be hosting a three-part series of monthly workouts designed to explore the island while bringing our unique love of concrete-jungle exercise, a high level of enthusiasm and high fivery. Join us on June 26th for the first installment of the monthly series! !